Why were so many buffalo slaughtered? How many bison/buffalo are there today? Where do buffalo live at today? Did Native American's really use all the buffalo? How did they use their Hide? How did they use their Horns? How did they use the Hair & Wool? What other parts of the buffalo did they use? What does buffalo meat taste like? Is buffalo meat hard to cook? Isn't all buffalo meat grassfed? Can I cook it like beef or in my beef recipes? Why doesn't Buffalo Groves have Hot Dogs? How big do buffalo get? How long to buffalo live? Do all buffalo have horns? Why do buffalo have a hump? Can I make a buffalo a pet? How much water do buffalo drink? How much land is needed to raise buffalo? What kind of fences do you need for buffalo? How different is it raising buffalo versus cattle? I heard that all buffalo are field killed, is that true? Buffalo have a bad rap, are they hard to manage? Why does buffalo meat cost more than beef? Why is the overnight shipping costs so high? What does it cost to purchase live buffalo? There is no difference. Bison is the scientific name and it's really bison-bison; but we all know the common name as buffalo. It's sort of like comparing canine to dog, or feline to cat (does that make sense?). They are North America's largest land mammal; and they are ruminant animals in the bovine family. They are descendants of the European Wisent. During the Pleistocene Ice Age the ancestors of today's bison-bison, the bison priscus crossed from Siberia into Alaska. Bison priscus evolved into bison-latifrons and lived in North America for 300,000 years. 22,000 years ago bison-latifrons evolved into bison-antiquus. 10,000 years ago bison antiquus evolved into today's bison-bison. As part of the U.S. government's plan to eliminate the Native American's, bison were slaughtered in great numbers to eliminate the Native American's food source. They were also slaughtered for their hides, tongues, and their bones were used for fertilizer. Around the year 2000 there were about 250,000 bison, which the bison industry estimates will reach 1,000,000 near the year 2005. All across the US, and even outside the US. Mainly buffalo are raised by buffalo ranchers; but they are also at some Conservancies, Parks, and even Zoos. Buffalo calves are born weighing between 35 to 50 pounds. Bulls will grow to 6 ft at the hump and may weigh as much as 2,400 lbs. Cows will grow to about 5 ft at the hump and can weigh over 1,000 lbs. Buffalo should live 25 to 30 years in their natural environment. But often today's buffalo raised with additional supplemental feeds cause them to have health problems, which end their life in their teenage years. This is just one reason Buffalo Groves, Inc. chooses to raise our bison as naturally as possible and are committed to only grass feeding. When buffalo (bison) are born they do not have horns, but do have buttons, which will grow into horns on both males & females. Unlike antlers on deer or elk, bison only get one set of horns. Buffalo (bison) look big and slow, but don't be deceived. They can run very fast, turn real quickly, and jump quite high. Please NO! Buffalo are not domesticated... they are wild! And, the most dangerous buffalo is a "sort of tame buffalo". Buffalo get big and their size alone can be dangerous. Their hump is needed as a counterbalance for their large and heavy head. But, as they mature the hump prevents them from rolling over. Hide was used for clothes, shoes, tepees, blankets, etc. Horn caps were used for spoons, cups, powder horns, tools, toys, ornaments and ceremonial items. Hair & Wool were often used for ropes, halters, pillows, pads, bracelets and balls. The brains were used for preparing the hides. Teeth were used for games and ornaments. Tails were used as fly swatters, whips, and decorations. Chips were used for both fuel and diaper powder. Tallow (fat) was used for soaps, oils & cosmetics. Hoofs were used for glue, rattles and spoons. Sinew was made into bow strings and sewing thread. Bladders and other intestines were used for pouches, bags, buckets, and canteens. Well first off, we never raised cattle; but we see neighboring cattle ranchers doing things like checking for calves in the winter, pulling calves which cows are having trouble birthing, and worrying about such things as food, water, and if their animals will survive a storm. For us raising bison, we do none of the above, so it's easier and much less stressful. No that information is not correct. Most buffalo raised for meat are slaughtered in processing facilities (some being state managed plants, and some being USDA inspected plants); and there are a few producers who field harvest (most of which are not then selling USDA inspected meat). The difference say between buffalo and cattle is that there are fewer plants that have adequate facilities for processing buffalo (another reason for the cost difference in buffalo meat). Dave likes to say you can get a bison to go anywhere he wants to go; but really if you are not aggressive in managing your bison, they are not aggressive animals. We don't chase our bison on horses or motor vehicles; nor do we walk among them without remembering they are a wild non-domesticated animal. Buffalo (bison) are herbivores, which mean they are designed to eat grass! Actually they thrive on it. But, not all bison eat as healthy as they should. Some bison are feed like cattle in a feedlot, while Buffalo Groves bison are entirely grassfed. Buffalo/bison seem to drink about 10 -12 gallons of water per day (a bit more in the summer). They can eat snow for a while; and will jump on icy water tanks to break the ice for water. Also, when they are thirsty - they will search for water. We are asked this question - weekly... And, it's a difficult one to answer. Buffalo can of course, be raised in small pastures and fed year round... or folks can raise them and perhaps only supplement feed in the winter... or folks can raise buffalo without feeding them (even grass) at all. To do this you need to determine how many acres are needed per animal unit (1 buffalo is 1 animal unit). You can get information from your local county extention office and other agencies like the U.S. Dep.t of Ag. Other factors are if the land is dry or irrigated, etc. This depends on the amount of land and the surrounding land. The closer you are to neighbors, the higher you may want your fence. Many people in the bison industry use a special high-tensile wire for their fencing, and they use t-posts up to 6 or 7 ft. tall. Buffalo (bison) meat tastes great! It's a rich and flavorful meat, but it is not gamey. Not at all, if you just remember it is much leaner than beef. For steaks, we say "think pink". For roasts the phrase is "low & slow". And for burgers remember "when you flip 'em, don't squish 'em". Touchy question... Like Beef animals, Buffalo start out on grass... and like most beef animals, most buffalo get "finished" with grain (many, many in feed lots - just like beef)... 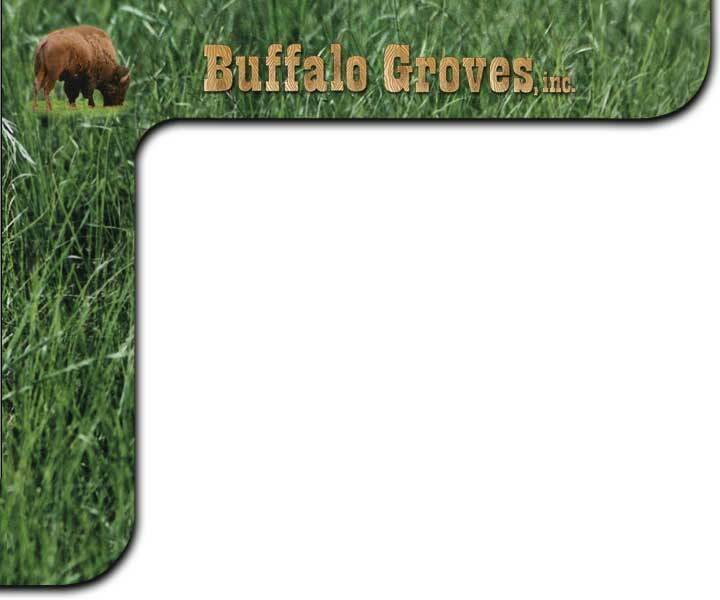 PLEASE REMEMEBR, BUFFALO GROVES, IS ALL GRASS - No Corn, No Oats, No Feedlots! (And our USDA Label says so!) If you want to know if someone is "all grassfed", you need to ask them if they finish on grain or if they ever feed anything besides grass. Absolutely. You can prepare the same dishes with bison that you have in the past prepared with beef. Roasts, Steaks, Casseroles, Stews, Mexican and Italian dishes, and much more. We are investigating preparing a buffalo hot dogs, but are concerned about nitratie/nitrites. To quickly make a hot dog would likely require adding nitratie/nitrites. The Food & Drug Administration lists nitrates/nitrites as cancer causing... therefore will not allow it added to any new products like buffalo (bison). So, to make a hot dog,(like others do), we would have to add beef, pork turkey or some other already approved for nitrates/nitrites product... which we just won't do. But, we are investigating a natural buffalo hot dog (and a buffalo brawt dawg); so if we are successful, we'll add it to our product offering. First off, purchasing buffalo for breeding stock costs a bit more than beef. Second, it does cost more for buffalo fencing and facilities than beef. Thirdly, processing costs for buffalo are much, much higher than beef (and there are few processing plant that will process buffalo). Forth, USDA inspection for Beef is FREE; while for Buffalo it is billed at over $32.00 per hr. Fifth, there is not much information available to the public on buffalo meat so buffalo producers like Buffalo Groves), spend lots of money on marketing, education and web sites. Our industry does not help (nor have funds to help) us with this big expense. Overnight shipping is expensive for anything other than a letter (which is about $15), and for meat a cooler is needed and then it's placed in a box. So sometimes, the billable rate is not the actual weight (example 4 lbs); but actually what is called dimentional weight (the sixe of the box - 13 in x 9 in x 8 in). And of course, it's based on the to - from zip codes. So for us to ship to Kansas (from Colorado), it's cheaper than shipping to Maine (from Colorado). It's different to purchase a live buffalo for meat than it is for breeding. For breeding stock it varies between male and female; and it definately varys between calves, yearlings, two year olds, and older. We are contracting 2006 heifer calves for $600 and are almost sold out (some folks are selling them for $1,200); some as high as $2,500. Meat Bulls are always in demand, and at acutions they are selling for $1.00 lb to $1.20 lb (live weight). Breeding Bulls are sold anywhere from $2,500 to $10,000. Buffalo beyond "2 - 2 1/2 yrs old" do not sell well (most who buy buffalo for "new herds" or "for meat" want them young!